Dr. Peter J. Jin is a new assistant professor at the Department of Civil and Environmental Engineering (CEE) and an affiliated member of the Center for Advanced Infrastructure and Transportation (CAIT). 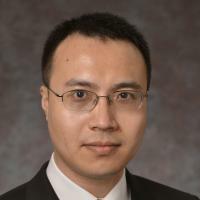 His research area is in Intelligent Transportation Systems with special interests in mobile sensor and content data, connected vehicles, and active transportation and demand management. His recent research interests include transportation Big Data analytics, vehicle-to-infrastructure communications, and unmanned airborne vehicle (UAV) application in traffic monitoring and incident management. • Mobile Sensor Data Modeling and Applications: including probe data based traffic state estimation and Lagrangian Traffic Flow Models. • Microscopic Vehicle Characteristics and Control in Connected Vehicle Environment: focusing on the bi-directional control, traffic stability analysis, cyber security, adaptive cruise control, and microscopic traffic coordination methods. • Transportation Big Data Analytics: including data mining on social network data, mobile location data for travel demand and activity pattern analysis. • Traffic operations: including freeway traffic flow and traffic management models, methodologies, and technologies, arterial traffic state estimation, Active Traffic and Demand Management (ATDM) technologies and their microscopic implementation. Peter J. Jin, Andrew Walker, Meredith Cebelak, C. Michael Walton, Essam Nassar, Strategic Environmental Sensor Station (ESS) Location Determination Method Based on Weather-Related Crash Data for Road Weather Information System (RWIS), Transportation Research Record, Accepted for publication, 2014. Jing Jin, Steven Parker, Jie Fang, and Bin Ran, Freeway Recurrent Bottleneck Identification Algorithms Considering Detector Data Quality Issues, Journal of Transportation Engineering, 138(10), pp. 1205-1214, 2012. Fei Yang, Yang Cheng, Jing Jin, Da Yang, and Bin Ran, Wireless Communication Simulation Model for Dynamic Cellular Handoff-Based Traffic Monitoring Systems: Framework and Evaluation, Transportation Research Record, 2291, pp. 26-34, 2012. Liang Zheng, Shiquan Zhong, Peter J Jin, and Shoufeng Ma, Influence of Lateral Discomfort on the Stability of Traffic Flow Based on A Visual Angle Car-Following Model, Physica A, 391(23), pp. 5948-5959, 2012. Yang Cheng, Xiao Qin, Jing Jin and Bin Ran, An Exploratory Shockwave Approach to Estimating Queue Length Using Probe Trajectories, Journal of Intelligent Transportation System, 16(1), pp. 12-23, 2011. Yang Cheng, Xiao Qin, Jing Jin, Bin Ran and Jason Anderson, Cycle-by-Cycle Queue Length Estimation for Signalized Intersections Using Sampled Trajectory Data, Transportation Research Record, 2257, pp. 87-94, 2011. Xia Wan, Yi Zhang, Peter J. Jin, Bin Ran, Wei Wang, and Jun Chen, Same-Day Mode Choice Modeling with Household Vehicle Usage Simulation in Developing Countries, Transportation Research Record, No. 2239, pp. 23-33, 2011. Wei Wang, Jing Jin, Bin Ran, and Xiucheng Guo, Large-Scale Freeway Network Traffic Monitoring: A Map Matching Algorithm based on Low-Logging Frequency GPS Probe Data, Journal of Intelligent Transportation System, 15(2), pp. 63-74, 2011. Jing Jin, Bin Ran, Automatic Incident Detection based on Fundamental Diagrams of Traffic Flow, In Transportation Research Record, 2099, pp. 65-75, 2009. Zhijun Qiu, Peng Cheng, Jing Jin, Bin Ran, Cellular Probe Technology Applied in Advanced Traveler Information System, World Review of Intermodal Transportation Research, 2(2-3), pp. 247-260, 2009. Chen Yang, Wei Wang, Xiaofeng Shan, Jing Jin, Jian Lu, Zhibin Li, Effects of Personal Factors on Bicycle Commuting in Developing Countries: Case Study of Nanjing, China, Transportation Research Record, 2193, pp. 96-104, 2009.